Have a complex problem? Consider a simple solution – simply ‘accept’ the problem! Complex problems need not necessarily have complex solutions. In fact, if you accept – and not deny – that you have a problem, the solution to any problem situation is often downright simple. Some years ago, deep in the throes of a our Firm’s bankruptcy, my wife and I were advised to meet a Siddha Yogi on the outskirts of Chennai. I was reluctant to meet him. My logic was that ours was a complex real world problem – 179 creditors, $ 1m+++ in debt, no work and no income in sight and no cash. How could worship and prayer repair our situation? Not that we had not tried those. We had. And nothing had really worked. But we still went to meet the Siddha Yogi because a close friend was insisting that we meet him. I remember coming out of that meeting in utter disbelief. How could a complex problem as the one I was faced with have such a simple solution? Besides, who would want to embrace their debt? It was a ghastly suggestion I thought. Why would anyone want to embrace whatever was causing them pain? Why would anyone want to embrace their problems? Although I began thinking about it right away, it took me several months of resisting, suffering and refusing to accept my problem – which is the fact that we were bankrupt and were in deep, deep debt – to realize the value of what the Siddha Yogi had prescribed to me in just a few minutes. I had rejected his sage counsel because his solution was too simple and I felt it perhaps did not apply to my complex business – and Life – situation. But when I finally understood what he had told me, I found it very, very meaningful. In saying what he did, the Siddha Yogi, had actually championed acceptance. He was saying that whatever be the situation that Life has placed you in, accept it. 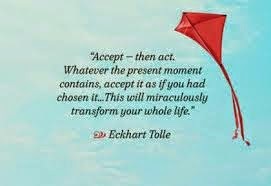 Because there is no way your situation is going to change even if you chose not to accept it. It is what it is. Always. What he said mirrored what the Buddha too has said: “Accept the pain.” When you accept whatever is causing you pain, you don’t suffer. And when you are not suffering you can deal with your pain, with whatever situation you are facing, with enormous clarity and focus. True. Our business and Life situation is far from being repaired. But acceptance of our problem has given us the equanimity to deal with it daily. I have shared my learnings and experiences of this awakening into self-awareness in my Book – ‘Fall Like A Rose Petal – A father’s lessons on how to be happy and content while living without money’. An important and unputdownable learning is that complex problems need not necessarily have complex solutions. Simple solutions too exist. And often while those solutions don’t immediately solve a problem situation, they help deal with the situation – any situation – better! Author AVIS ViswanathanPosted on August 13, 2014 March 14, 2016 Categories Acceptance, Art of Living, Buddha, Fall Like A Rose Petal, http://schemas.google.com/blogger/2008/kind#post, Inner Peace, Intelligent Living, Pain, Siddha Yogi, Solutions, SufferingLeave a comment on Have a complex problem? Consider a simple solution – simply ‘accept’ the problem!